This pen costs a massive $1,470,600. Yes, you heard it right! This is the most expensive pen and only one pen is manufactured every year for sale. It contains over 30 carats of De Beers's diamonds and has a 18K solid gold nib. Designed using the ‘Divine Proportion of Phi’ as it is used only by some best masterpieces, the Fulgor Nocturnus pen stands high among the most expensive pen's list and was auctioned for more than €7 million. Made by a well known Swiss Company Caran dAche, this is listed in the Guinness World Record for the most expensive pen of 2001. 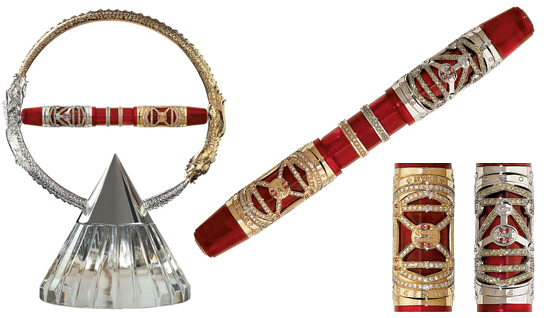 Coated with silver, a nib made of 18K gold and equipped with diamonds and rubies made it epic. It was created by Robert Perron, a famous jewellery maker. Montblanc teamed up with Van Cleef & Arpels to celebrate their 100th birthday. This collaboration resulted in Montblanc’s Mesisterstük’ pen, a true masterpiece that costs €650,537. With a price of $60,000, this pen is made out of platinum and yellow enamel. With its 18K gold nib thus limited edition pen is amazing! Made of 18K white gold, diamonds and a two-tone18K gold nib, this is one of the most remarkable Visconti pens and costs you $57,000.00. This model is both beautiful and luxurious. It has two nibs and an internal ink reservoir for ink fillers. 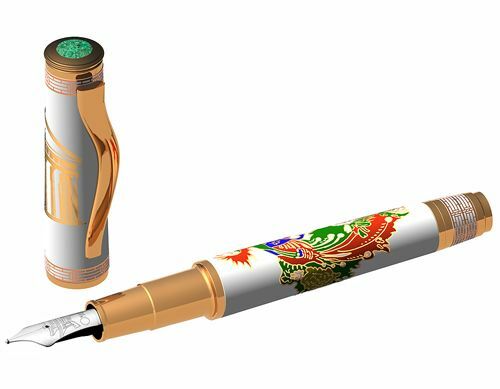 The pen is made of 18K gold giving you true royal writing experience.